Comet assay is an invaluable tool in DNA research. It is widely used to detect DNA damage as an indicator of exposure to genotoxic stress. 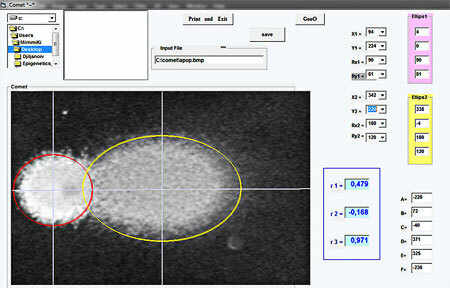 A canonical set of parameters and specialized software programs exist for Comet assay data quantification and analysis. None of them so far has proven its potential to employ a computer-based algorithm for assessment of the shape of the comet as an indicator of the exact mechanism by which the studied genotoxins cut in the molecule of DNA. Here, we present the development of specialized software for comet assay data analysis, which allows fast and precise discrimination of the type of DNA damage. The software is named CometShape© which is completely in unison with its way of functioning. It analyses comet images by mathematical description of their shape and by following an algorithm for calculation of more than 14 comet shape parameters leads to statistical elaboration of three coefficients of correlation: r1, r2 and r3. By this everyone could very easily determine the type of DNA damage in the cells induced by the studied genotoxin. Georgieva, M., Zagorchev, P., & Miloshev, G. (2015). Random, double- and single-strand DNA breaks can be differentiated in the method of Comet assay by the shape of the comet image. View this article on the publisher’s website. 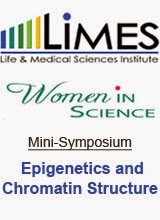 We are involved with research in the fields of chromatin, linker histones, epigenetic processes and more.